The effectiveness of CO2 as a greenhouse gas becomes ever more marginal with greater concentration | Watts Up With That? ← Global warming and the Titanic II – on an epic collision course? Has anyone ever managed to get an alarmist to accept this? I’ve never seen it on the blogs I visit. Too much of An Inconvenient Truth, I suspect. So it all hinges on guesses about feedbacks. No wonder R Lindzen focusses so much attention on getting empirical data on that detail. Your conclusion of we can’t get 2 deg C warming rests on your “5%” more statement. What exactly do you mean here? 5% of what? Unless you think climate sensitivity to CO2 is zero, there will be a contraption of CO3 that will yield a 2 C rise in temps as there is no upper bound to the sensitivity equation. As you said, it is logarithmic so the concentration may be high but it should be a finite & definable number. It would be greatly appreciated if somebody could provide me with a layman’s way of explaining this to people. Even when I tell people the logarithmic path CO2 follows is not in dispute, just the shape of the curve, they don’t get it. Dr. Ball once explained it as painting a window black. Each coat is going to have less and less of an effect. But that doesn’t provide a good parallel explanation as to why. If anybody could help me out, it would be greatly appreciated. The NCAR radiation code says that 40 ppm CO2 would be needed to get 50% of the current CO2-caused warming, rather than 20 ppm, but, either way, the lesson is clear: we’re well past the point of diminishing returns w/r/t the warming effect of CO2. The alarmist projections of wild increases in temperature are based on assumptions of dramatic amplifications of the warming effect through positive feedbacks. But for the tropical atmosphere MODTRAN calculates only +65% amplification from water vapor, and that’s really an upper-bound, because it doesn’t taking into account various negative feedbacks, such as water-cycle (evaporative) cooling. But at higher concentrations it will transition to a square root dependence which will give a higher sensitivity. But I guess that a simple explanation would be one inconvenient truth too many for many “climate scientists”. This is one of the reasons warmists bang on about ocean ‘acidification’. They know mother nature won’t play ball with warming so they need something else to scare the children with. is so very well hidden. You would never know it was there if you didn’t read it. Is Ed Hoskins going to tell us how the magic numbers were calculated? One can add CO2 to the point where lead will melt on the surface of Venus. Just keep adding CO2 until you get to 92 bar of pressure at the earth’s surface. Then you have essentially recreated the Venusian atmosphere, and the surface temps would rise to 872 °F. Not sure why you think this statement is true. False. If CO2 concentrations were to increase indefinitely we could get to a situation where 90% of the atmosphere (which is now ten times more dense) then on up to Venus style atmosphere. This would entail a much larger than 5% increase in temperature. Isn’t 872 °F more than 5% greater than say 90-100 °F even when I convert to Kelvin. Let’s see 305 K vs 739 K. Yep that’s a >100% rise in K.
So please reword this information so that it is true if you mean something else. As written these are falsehoods. Adding CO2 would eventually effect atmospheric density. Are you talking about replacing part of the atmosphere with CO2 while maintaining the same atmospheric weight of 14lbs per square inch at sea level, so that the maximum would be 100% CO2 at one earth atmosphere of pressure sea level when finished? Obviously that cannot go on indefinately because you have to stop at 100%. So that must NOT be what you mean. So what do you mean? The ‘alarmists’ pin their hopes on ‘positive feedbacks’, which, as an engineer who specialized in feedback systems prior to giving up Phd work as a lost cause, I find to be tenuous at best. If there were ‘positive feedbacks’ as the ‘alarmists’ believe the earth would have spiraled into a Venus like atmosphere hundreds of millions of years ago. The fact that it hasn’t if prima facia evidence that there are no large ‘positive feedback’; mechanisms at work in the earth-atmosphere system. There’s no concrete evidence that CO2 has any effect at all on global temperature … it could all be the soda bottle effect. So how do you envisage the change in orbit? This fact also explains why CO2 is so important in accelerating the warming at the end of an ice age, when atmospheric CO2 is very low. Are there any other publications on this? If this is true, then its implications are truly epic. The effectiveness of CO2 as a greenhouse gas is zero. The physical parameters are not well understood by the pseudoscientists pushing for global warming. There are two reasons for thinking that its effectiveness is zero. The first one is derived from the absence of any kind of warming for the last fifteen years. There is more carbon dioxide in the air now than ever before but it’s not doing its warming thing. Without warming, no greenhouse effect and no AGW is possible. Has that alleged warming ever existed? The answer is no. If you check the global temperature curve you will find that there has been no greenhouse warming for the last 100 years. The second reason is Ferenc Miskolczi. The correct way to determine the greenhouse effect is to account for the activity of all greenhouse gases present. In our case this means carbon dioxide and water vapor. Arrhenius did it only for carbon dioxide which leaves his theory incomplete. If you use both carbon dioxide and water vapor you find that an optimum window for absorption of infrared radiation exists that they jointly maintain. If you increase carbon dioxide and thereby increase IR absorption water vapor will diminish to restore the optimum absorption for the atmosphere as a whole. As a result, total absorption of IR by the atmosphere does not change when carbon dioxide is added, and this is what Miskolci observed in 2010. Such cooperation between the two greenhouse gases amounts to negative water vapor feedback, the exact opposite of what IPCC uses to get their very high warming predictions. Since greenhouse warming gets its energy from absorption of IR radiation and since total absorption no longer follows carbon dioxide concentration it follows that greenhouse warming is impossible. We see that of course today when the highest carbon dioxide ever has no warming effect. A log graph of CO2 effect on temperature would be very appropriate for this article. Mike H, here’s a stab at an explanation for laymen. The misnamed “greenhouse” effect of greenhouse gasses like CO2 is based on the fact that they are not truly colorless. They have a “tint,” though we can’t see it, because it’s in a part of the light spectrum that our eyes don’t detect. GHGs are transparent in the visible part of the light spectrum, but they absorb (block) parts of the IR spectrum. Adding such gasses to the atmosphere has a warming effect on the lower atmosphere, because the light arriving at the earth from the sun is much “bluer” (shorter average wavelength) than the light emitted from the earth. Because the earth is relatively cool, the light emitted from the earth is mostly IR. So anything in the atmosphere that blocks IR but is transparent to visible and UV will have a warming effect, because it lets in most of the arriving solar radiation (that warms the earth), but blocks a much larger percentage of the departing radiation (that cools the earth). Even though CO2 levels are measured in parts-per-million, there’s nevertheless already so much CO2 in the atmosphere that it blocks nearly all of the IR that it can possibly block. So adding more CO2 doesn’t have much effect on temperature. For CO2’s main absorption bands, we’re way, way past the CO2 levels at which the IR is all absorbed. Only for very narrow ranges of wavelengths at the fringes of those absorption bands, where CO2 is a very weak absorber, can adding more CO2 appreciably increase the amount of IR blocked. However, adding even a small amount of a different GHG (such as one of the CFCs or HCFCs) can have a much larger warming effect, by blocking a part of the IR spectrum for which the atmosphere would otherwise be transparent. That’s why you may read that CFCs like Freon-12 are thousands of times more potent as GHGs than CO2. It’s not that there’s anything fundamentally special about Freon-12, it’s just that there’s so few Freon-12 molecules in the atmosphere that some of their absorption bands aren’t already blocked. Here’s an analogy. Consider moth-eaten blankets to be like GHGs, and different positions one the blankets correspond to different parts of the IR spectrum. The blankets have big holes in some places, but nice, dense wool fabric in others. Different patterns of holes in the blankets are like different GHGs. They pass some parts of the IR spectrum, and block others. So “CO2” blankets have one pattern of holes, “CH4” blankets have a different pattern of holes, “CFC-12” blankets have yet another pattern of holes, etc. Now, envision an obsessively compulsive neat-freak piling on moth-eaten blankets to try to keep warm in a chilly night. He exactly straightens and lines up each blanket on the bed. If he piles on a dozen identical “CO2” blankets, with the holes all lining up exactly, he won’t be much warmer than if he had only one or two “CO2” blankets. But if he adds a “CH4” blanket, with many of its moth-holes in different places, then he’ll be a lot warmer, because some of the CO2 blanket’s holes will be blocked by the CH4 blanket, and vice-versa. And if he adds a “CFC-12” blanket, with some of its holes in different places than the holes in the CO2 and CH4 blankets, he’ll be warmer yet. Right now, we’ve got about 10 or 20 CO2 blankets piled on. Adding another 5 or 10 or 20 CO2 blankets will keep us a tiny bit warmer at the frayed edges of the holes, but it won’t make near as much difference as adding some other kind of blanket. False. If CO2 concentrations were to increase indefinitely we could get to a situation where 90% of the atmosphere (which is now ten times more dense) then on up to Venus style atmosphere. Seriously? Since only 20% of the atmosphere is oxygen, how are you going to get CO2 over 20%? Or are you assuming some massive source of oxygen as yet unknown that will suddenly spring into existence in order to be converted to CO2? Or by “adding” CO2 do you mean brand new C and O that don’t exist anywhere at all coming into existence? By magic? Transported through a black hole maybe? Or big space ships that scoop it up from Venus and import it to Earth? The rest of your comment is similarly irrelevant to any reasonable discussion of the science. Something wrong here: if you use Modtran for the first step, looking down from 70 km height, 1976 US standard atmosphere, no clouds or rain, the difference between 0-100 ppmv CO2 is near 7°C. Modtran also says if you go from pre-industrial 280 ppmv to a double 560 ppmv, the temperature increase is ~0.9°C, which is quite different from the 0.14°C extra (from 300 to 600 ppmv) in your calculation. What is going wrong here? Logarithmic is not asymptotic. Logarithmic means that each doubling in concentration has the same effect as the previous — so if going from 100ppm to 200ppm gives +0.2875C, then from 200ppm to 400pmm is another +0.2875C and going from 400ppm now to 5% (another 7 doublings) gets you the +2C. Of course you’re probably going to have to bake the CO2 out of a fair chunk of the carbonate rock on the planet to get that much into the atmospehere. Just burning the fossil biosphere wouldn’t do it. This implies that it’s meaningless to cut CO2 emissions now unless the rest of the world—i.e., Asia—does the same, AND makes massive cuts, to lower the current CO2 level to, say, 350. Lacking a worldwide effort, any cuts in the West will merely slightly slow the rate at which additional CO2 accumulates. This also implies that the IPCC’s charts showing a substantial difference in warming between scenarios where CO2 continues to rise at current rates (“business as usual”) and where its rising is halted and emissions continue only at present levels are badly wrong—especially if CO2 has a long residence time. There should be nearly no difference between them. No, atmospheric CO2 levels have never been “very low” on planet Earth, even during ice ages. CO2 levels are thought to have been a few hundred ppm for at least 50 million years. CO2 levels are held in a relatively narrow range largely because of a simple biological feedback mechanism: With less than about 200 ppm, plants stop growing because they can’t scavenge carbon from the atmosphere, so they stop absorbing it. But as CO2 levels go up, plants grow like crazy and absorb it. (The oceans also buffer CO2 levels.) Even at ~200 ppm CO2, which is probably as low as it has ever gotten, MODTRAN calculates that there’d still be about 10x as much CO2 as is needed to produce half of the current CO2-induced warming. That’s wrong, Arno. Even if there were such a negative feedback mechanism (for which there’s no obvious physical explanation, since warm air holds more H2o vapor rather than less), it still would not reduce the warming effect of CO2 to zero. Negative feedback can reduce the magnitude of an effect, but never to zero. Not so difficult to reach much higher CO2 levels beyond the 20% oxygen: lots of CO2 is buried in very thick chalk layers on lost of places. That is where the ancient CO2 levels went. Add some acid to it (like a few thousands of volcanoes all erupting over thousands of years) and you will have any desired quantity of CO2 in the atmosphere. Brian Macker, you make an interesting point but it doesn’t stand up to scrutiny. How could we increase CO2 indefinitely ? Burning fossil fuels causes carbon atoms in the fuel to combine with oxygen atoms in the air to produce CO2. As only 21% of the (dry) atmosphere is oxygen we surely couldn’t cause the CO2 concentration in the atmosphere to exceed 21% even if we burnt the entire planet. And we would all have died of asphyxiation well before we could accomplish this. Remember that all of the carbon in fossil fuels was fixed from the atmosphere by plants in the first place so releasing this back into the atmosphere can, at worst, create the CO2 concentration under which life self-evidently originally flourished. Even 550 million years ago, before the first plants invaded the land, the CO2 concentration was only 7000 ppm (0.7%). I don’t know how air pressure at the earth’s surface would be affected – CO2 is a heavier molecule than oxygen – but surely a change in the composition of 0.7% of the atmosphere would make tiddly squat difference. Um, the article is not very effectively written. What the author MEANS to say isn’t that the target of <2C warming cannot be achieved, it is that it cannot be missed, no matter what happens to the CO_2. Neither statement is true, of course. We can no more believe the predictions of MODTRAN than we can any other climate model computation. A more direct computation of the temperature increase expected on a doubling of CO_2 (only) to 600 ppm is a still highly uncertain 1 to 1.5 C, at least 0.3 of which we have already observed. But the uncertainty in TOTAL warming goes beyond this, as it involves unproven climate feedbacks almost entirely from the water cycle, where water already provides over 95% of our total GHE and where water is enormously complex in its integrated effect on the climate. Water vapor is a powerful GHG in much higher concentration than CO_2 in the atmosphere. Water has a huge latent heat of vaporization and fusion and is a major factor in the transportation of heat from one place to another laterally and from the ground to the upper atmosphere vertically. Water is key to plant growth, and plants moderate climate in a number of ways. Then there are the other feedbacks from things like soot and aerosols co-produced with CO_2 in most burning circumstances. Then there are the largely unknown effects of the major decadal oscillations, which modulate the EFFECTIVENESS of water as a feedback mechanism by modulating where oceanic heat and water vapor go. Truthfully, we do not know what will happen to the climate by 2100. Perhaps it will warm more than 2 C. Probably it will not (and a lot of climate scientists are coming to believe that, as the Earth continues to stubbornly refuse to warm in parallel with a steadily increasing CO_2 concentration). Perhaps be can have an impact on the warming or cooling we eventually do experience. Perhaps not — it is simply not possible to separate out the fraction of the warming and cooling observed over the last 2000 years and say "this much is due to CO_2". Not when we cannot predict or explain the gross variations observed over that timeframe, not when those variations are as large or larger than what has been observed and attributed to CO_2 in the comparatively recent past. Dave Burton, warmer air is capable of holding more moisture than cooler air. But observations made over the past 60 years show that global relative humidity has actually been falling in contradiction of the standard model assumption that it should remain constant. Miskolczi’s result shows that, as near as dammit, the fall in humidity matches the increase in CO2 in terms of its impact on the greenhouse effect. This is the basis of Miskolczi’s claim that the sensitivity of the climate to 2xCO2 is zero. Well certainly. By the same token, you can pile up flap jacks high enough on top of coal to make diamonds. Also true and also irrelevant to any practical discussion about what humans may or may not be doing with carbon. The logarithmic fall-off of the effect of CO2 on the greenhouse warming of the Earth is one of the powerful arguments against man-made global warming and climate change. Thus with all carbonate acidified, the atmosphere gets 90% CO2, 10% air. And how is this acidification accomplished? There’s enough iron in the earth’s core to cover the earth surface with a sheet of steel. True, and irrelevant. ‘Tis one thing to say something is possible, another to say that there is any means of achieving it that is worth discussing from the perspective of human activity. The original commenter made the claim that if “we” keep adding CO2 to the atmosphere it will get to 90% and make earth like Venus. We’re not capable of any such thing, anymore than we are capable of turning coal into diamonds by the weight of flap jacks or covering the earth’s surface with a sheet of steel. facts! you don’t need no stinking facts when you have’ faith’ in the cause . So what means “accurate modeled” ? Does it mean that the mathematics in MODTRAN is robust, and if you input the same variables it always gives the same answer, or do you mean that MODTRAN accurately predicts what happens when atmospheric CO2 is changed. 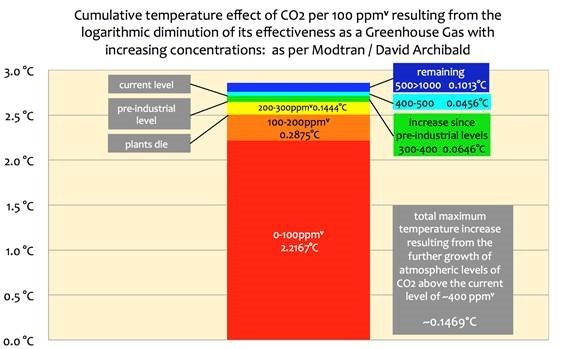 Can you give a reference to a graph of MODTRAN prediction versus measured CO2 that shows this logarithmic relationship ? Phil says that at higher concentrations (of CO2) the relationship transitions to square root. Presumably then, there is somewhere where it is neither logarithmic, nor square root. I’m used to both of those functions being valid over the entire possible range of variables; otherwise they are not of much use. Usually in mathematics, names have specific and usually precise meanings. Also true and also irrelevant to any practical discussion about what humans may or may not be doing with carbon. Depends of what humans do with what carbon: cement manufacturing sets CO2 free from carbonate rock, be it that part of it is recaptured when the cement/concrete hardens and more over time. But still quite impressive CO2 emissions from that (human) source. SO2 emissions from high sulphur coal and oil burning also set CO2 free from carbonate rock. What worries me is the too low calculation by the author of the increase by Modtran for the first step 0-100 ppmv, which affects all following steps. Accordingly only ~5% of the effectiveness of CO2 as a greenhouse gas remains beyond the current level. As far as I know, Modtran is a simplified version of Hitran, which is fully based on lab measurements of thousands of detailed absorption lines of different atmospheric components at different compositions and pressures. So far pure physics, translatable to the real world, but only for a clear atmosphere. Even though CO2 levels are measured in parts-per-million, there’s nevertheless already so much CO2 in the atmosphere that it blocks nearly all of the IR that it can possibly block. So adding more CO2 doesn’t have much effect on temperature. For CO2′s main absorption bands, we’re way, way past the CO2 levels at which the IR is all absorbed. Only for very narrow ranges of wavelengths at the fringes of those absorption bands, where CO2 is a very weak absorber, can adding more CO2 appreciably increase the amount of IR blocked. which means that the surface and atmosphere will warm – and continue to warm until equilibrium (incoming=outgoing) is re-established. Saturation in the lower in the lower troposphere, therefore, is not really relevant. DAve Burton: Thank you very much. isn’t that just based on ‘limited’ wavelength absorption though? but anyway – someone mentioned incoming vs outgoing earlier upthread – and in my opinion, this is the crux of the matter; i.e. that at some point (assuming incoming remains constant) the #stored’ incoming energy (as a reuslt of co2 !) has to reach a state whereby it ‘outgoes’ at the required faster rate – and equilibrium is achieved – ot is the logartihmic characteristic of the CO2 which means that EXCESSIVE temperatures can never be achieved. as per another comment – to achieve mega amounst of CO2 (thousands of ppm) is simply not possible without releasing a bucketload of ‘other’ co2 from carbonates, etc……..fossil fuels simply cannot do this alone AFAIK. Simple explanation based on first principles, aka the Beer Lambert law. How ever the article calculations seem off to me as the author may have looked at the central portion of the absorption band instead of the “wings” where the absorption is less saturated! 1/ There is only a certain amount of energy emitted from the planets surface that CO2 can absorb, aka the saturation point is when all if it is absorbed. 2/ The 50% point on this curve occurs at about 30ppm (IPCC) which represents a 50% probability of photon not being absorbed, ie, transmitted. 5/ as you can see each doubling has half the effect of the previous, It basically absorbs 50% of the remaining energy in the spectrum. The hard part is then figuring out how much effect it has directly since water vapour overlaps with two of the CO2 bands and we have an convecting atmosphere at all different temps! just a thought. what is the maximum energy density of the atmsophere ? By that, I mean the maximum thermal capacitance of a given zone of the atmosphere (LT, UT or whatever) based on its current composition? Surely, a fixed composition of N2/O2/Co2 has a fixed thermal capacitance? Does the actual thermal capacitance change much by the slight variation in CO2 ? because if not, then the transfer of the thermal energy (as absorbed by the CO2) must dissipate after it reaches the thermal capacitance (at relevant pressures) into adjacent material? This is obviously related to lapse rate – but I would have thought that a given cubic metre of ‘air’ has a fixed thermal capacitance at normal pressures – and therefore what is the change in that thermal capacitance when CO2 concentration is changed – for the life of me, I can’t see it being very much? It’s getting late, I may be missing something…..
CO2 absorbs certain wavelengths in the IR spectrum. At any given wavelength there is some concetration of CO2 that will absorb half the energy at that wavelength. Lets say that is X ppm. Doubling that concentration to 2X ppm will absorb half of what remains or 75% total. Each time the concentration is increased by Xppm, half the energy remaining will be absorbed. Since CO2 is virtually tranaparent to much of the IR spectrum, it cannot block all IR radiation at any reasonably conceivable concentration that could exist in our atmosphere. Take the planet Mars for example – if you look up into space from any point on mars that is anywhere near the average elevation of the planet’s surface (there isn’t any sea level to use a reference), you will be looking through approxmately 20-30 times the amount of CO2 that now exists in the earth’s atmosphere and it still only blocks part of the IR spectrum. This relatively large amount of CO2, by the way, only causes a minimal rise in Mar’s surface temperature. Here are a couple of ideas. The molecules of the atmosphere interact with the energy (wavelengths). Look toward the sun and you see bright yellowish light. The nitrogen and oxygen (most of air) scatter the blue wave lengths and other “colors” pass to the surface. The sky appears blue away from the sun because there are sufficient molecules to do the scattering. Now climb a mountain. High up the atmosphere has fewer molecules – not enough to facilitate the scattering. Sunlight is more intense but the sky is less blue and tends toward black. Reverse your hike. Go down. The number of molecules doing their thing increases, and the sky gets blue again. The ir-interactive gases provide a mechanism for a result (slowing the loss; if that phrase will do) similar to the idea of getting a blue sky. As the molecules accumulate, after a certain effect has been achieved (sky is blue) (warmth is provided) there is nothing left to do (within the normal bounds of the system). Want a more blue sky – create more oxygen and nitrogen gas and pump it into the atmosphere. I don’t think so. Now fold the paper in half and try again. Still readable. Do again. Still visible but going . . .
Continue. Depending on the quality of your wax paper . . .
by 5 or six doublings you cannot see text. Add all the paper you want – most all that can happen, has happened. Likewise with CO2. The CO2 being added to the atmosphere is helpful to plants. In any case, the energy still has to be removed from the system in some form and some manner. In some ways the so-called GHGs both slow and facilitate the removal. That is possible true but more than highly unlikely to actually happen anytime in the next few million years. In fact the point you are making is irrelevant to the discussion of the guest post. Burning all the carbon is impossible, atmospheric O2 of 16% or more is required for combustion. Where did this “+2.0 °C” come from? @ Kev in the UK — good for you to post at ALL with little kids to take care of. WAY TO GO, WUWT SCHOLARS!!! YOU ARE THE BEST. I am SO THANKFUL you take the time to explain and to so conscientiously respond to one another (and to the confused from the Cult, too). YOU ARE SO COOL!!! Heh, heh, sometimes, I’ll arrive at a thread only to find no one there but me. Silence. Before long, though, BOOM, BOOM, BOOM, BOOM, BOOM, BOOM, the sound of the feet of the Science Giants steadily heading this way. What a joy to listen to you all — BAM! BAM! BAM! — demolishing the speculation and conjecture of AGW, one by one. What a privilege to observe your reasoned, well-informed, discourse. We laypersons are SO BLESSED to be present at your discussions. Mmmmm. Let me also speculate. Here it is again in ‘proper’ format. 2. The simple relationship Teq = T2xCO2 x ln([CO2]/280)/ln(2) is used (see Meehl et al. (2007), Section 10.7, and Table 10.8), with upper and lower values of T2xCO2 of 2 and 4.5°C. b is the base you want to convert from. c is the base you want to convert to. …and I might add this shone through despite the troll distractions and misdirections. One more thought: Why would there be any great debate about the pause? Its pretty evident, surely? 1. IPCC (2007a) finds that the climate sensitivity is likely to be in the range 2°C –4.5°C, with a ‘best estimate’ of about 3°C, very unlikely to be less than 1.5°C and values substantially higher than 4.5°C ‘cannot be excluded’ (IPCC (2007a, SPM). The argument above is basically that the sensitivity is towards the lower bound and if you can establish the CO2 forcing sensitivity is low then what is written would also be accepted by the IPCC. High school chemistry. Partial pressure of gasses. If you increase CO2 something else must decrease or the pressure must increase. So either there will be less water vapor or the pressure will increase. However, if the pressure increases it is harder to evaporate water, and there will be less water vapor in the atmosphere. So, in all cases, adding CO2 reduces the water vapor in the atmosphere. Unfortunately climate scientist were so busy taking biology and arts classes, they missed the chem class on partial pressure. Strictly speaking, that is not true. It means there is more surface area radiating to space. And, since that surface area increases while the surface area back-radiating to the planet at worst stays the same, but more likely decreases, that means heat gets eliminated more efficiently. Result: surface cools. You can’t get warming by arguing that the outer radius of the effective radiating surface is increasing. We went through that on Willis Eschenbach’s “Steel Greenhouse” thread. Here is a simple derivation of the formula which allows simple calculations (and provides for the logarithmic chart). There was a thread a few months ago where Jan Perlwitz from GISS was questioning this simple formula and I wasn’t checking my email enough to respond in time but here it is now. Now you can put in any CO2 number you want into that formula and what will pop out is what the theory of global warming at 3.0C per doubling says the temperature anomaly will be. In practise however, the IPCC has a lag of when temperatures catch up to the GHG doubling and the chart looks more like this on the IPCC AR5 trendline – Zoomed-in to see it a little better). Can someone tell me the atmospheric CO2 level at which the absorption of IR bands are completely saturated? With and without an increase in water vapor. Try the sponge analogy. You see CO2 and a Sponge both absorb something. CO2 absorbes energy … a sponge absorbes water. The problem arises when you only have so much water. … or in CO2’s case energy. SO … you have this drop of water … you take a little sponge, and it makes the sponge wet. The bigger the sponge the less wet it will become. Eventually you’ll reach a size sponge where the sponge seems to remain dry. Getting a bigger sponge is not going to make any difference … it’s still going to seem dry. Likewise .. There is only so much incoming and outgoing energy. There comes a point where more an more CO2 doesn’t do anything, because you’ve already reached a level of CO2 that absorbes all of the radiation that is supplied. I have read this plausible snippet before. Gas below the radiating average height will be increasing their output too. It is not immediately obvious that the average radiative height will increase. I like to think of it as adding tiny fin extensions to my lawn mower, I would expect it to run cooler. The more heat the more convection. No? I keep reading that GHGs trap heat. Solids can trap heat; the glass roof of the greenhouse; the insulation in your wall; a blanket. If the Sun sets, even a little bit, CO2 means nothing. I just don’t get the focus on what means nothing. Then again, it is a living for so many who publish now days. So,,,,, perhaps a song that applies to both trends? Since water vapor and CO2 both trap heat at the same wavelength at what humidity level is water vapor effectively the only green house gas. My estimate would be 10-15 percent. Anyway if we burnt everything we could I doubt we could get over 1500ppm. Never argue with a fool they will lower you to there level and beat you with experience. No you haven’t “essentially recreated the Venusian atmosphere”. Venus has only trace amounts of water vapour in its atmosphere. If you were to hypothetically quickly add say 60-80 kms depth of what would become liquid CO2 under that pressure, then our ocean would still float on top of that to a depth of around 2-3kms and the oxygen/nitrogen atmosphere we have now would be atop that. Why would you assume it wouldn’t stratify? 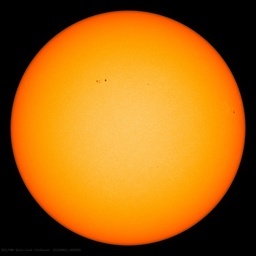 As no sunlight would reach the 60-80kms of liquid CO2 then there is no reason to expect it to warm the planet in anything like the way Venus is warmed. Wikth respect to the warming effect of CO2: 2 billion years ago, the Earth’s atmosphere was about 20 percent CO2, iu.e., 500 times the present concentration, before this CO2 was converted to oxygen by blue-green algae phoitosynthesis (and some part of it also later into animal skeletons, e.g., in corals, as carbonates, and ultimately into carbonate rock). And since the atmosphere was significantly thicker then, with perhaps as much as a third of it blown off later by asteroid impacts, that the actual CO2 inventory before the blue-green algae kicked in was more like 750 times the amount today. It would seem that far more than even Earth’s original CO2 inventory would have led to extreme warming, if large concentrations really did have a linear oir nearly linear incremental effect. But that didn’t happen because even 20 percent in the atmosphere wasn’t enough to prodfuce that effect. Venus is a totally different case – not only nearer the Sun, but its atmosphere is so thick that ground-level pressure is close to 100 times that on Earth. The heating on Venus is likely less due to CO2, even as 95% percent of the atmosphere, than to the compression. It’s the same effect you have in the cylinders of a diesel engine – compressing the fuwl mixture heats it oi very high temperatures, sufficient for ignition. Moving energy via conduction (fins on your lawn mower) is a different set of physics from moving energy via radiance. ,A few corrections to last post (sleepy, I guess): I meant to say that because Earth didn’t burn up even with 20 percent CO2 in the air, it would have taken much more even than that for there to be extreme warming. “Remarkably, IPCC Published reports , (TAR3), do actually acknowledge that the effective temperature increase caused by growing concentrations of CO2 in the atmosphere radically diminishes with increasing concentrations. This information is in their report. It is well disguised for any lay reader, (Chapter 6. Radiative Forcing of Climate Change: section 6.3.4 Total Well-Mixed Greenhouse Gas Forcing Estimate). Additionally,as I recall, the conventional value for the total GHE is 33C, the difference between Earth’s temperature with its atmosphere or without it. In comment above rgb indicates ” water already provides over 95% of our total GHE”, a value i suspect is close. You suggest that, just from 0-100ppm CO2 is responsible for 7C. 7/33 = 21.2%. You then suggest that doubling from 280ppm to 560ppm will yield another 0.9C. 7.9/33 = 23.9%. You don’t provide a value for the 1.4 doublings from 100ppm to 280ppm, but a rough interpolation would suggest that CO2 is responsible for a full third of the GHE. That’s fairly bold. although there does appear to be at least one spot on the planet where itis actually the case. Spectral and Broadband Longwave Downwelling Radiative Fluxes, Cloud Radiative Forcing, and Fractional Cloud Cover over the South Pole. Annual cycles of downwelling broadband infrared radiative flux and spectral downwelling infrared flux were determined using data collected at the South Pole during 2001. Clear-sky conditions are identified by comparing radiance ratios of observed and simulated spectra. Clear-sky fluxes are in the range of 110–125 W m−2 during summer (December–January) and 60–80 W m−2 during winter (April–September). The variability is due to day-to-day variations in temperature, strength of the surface-based temperature inversion, atmospheric humidity, and the presence of “diamond dust” (near-surface ice crystals). The persistent presence of diamond dust under clear skies during the winter is evident in monthly averages of clear-sky radiance. I assume you’re familiar with the temperature history at the South Pole over the last 40-50 years, so i won’t take the time to find a link. Personally I suspect the global average contribution might be even smaller than the <5% that rgb suggests. If you, or anyone else, is interested in my speculation I posted a slightly shorthand version of it in a recent thread. It's about the twelfth time I've put it in a comment over the years, each time fully expecting my ideas to be quickly demolished. So far that hasn't happened. I could put that down to the incredible brilliance of my impeccable logic, although I suspect a more reasonable assessment would be that most of my comments are completely ignored. Have you got a graphic of some kind that demonstrates your point? It is difficult to visualise your comment especially as you provide mo actual figures or links. It’s called ‘the curve of growth’, at very low concentrations the absorption is linear (B-L) at high concentration it’s square root, in between it passes through logarithmic which is where our current atmosphere is for the 15 micron band of CO2. Science of Doom did a piece on the curve of growth too. And a very good layman’s illustration of the deep ocean penetration of directly incoming shortwave solar radiation but the ocean’s opacity to CO2-re-radiated, longer wave infrared radiation is the simple fact that the deep sea is blue and cold. It is mostly the shortest wavelength blue light that penetrates it. Some longer wavelength green, yellow and red light does get down to shallow depths (hence the colours of corals and tropical fish when snorkelling), but the sub-visible, longer wave infra-red wavelengths of heat re-radiated by CO2, do not get down to any depth at all. They don’t, so your subsequent argument is moot. It wouldn’t become liquid it would be a supercritical fluid which has a density less than that of water so your scenario doesn’t apply. Why not, sunlight reaches the surface on Venus despite the dense clouds in the Venusian atmosphere. Doesn’t matter if the hypothetical was possible. It was the authors hypothetical. He claimed that you could keep adding CO2 indefinitely and not get more than 5% increase. Which is false. How he was going to do this doesn’t matter. He can fly the stuff from Venus in spaceships for all I care. Seems like some here are as dense as the Venusian atmosphere if they don’t understand what a hypothetical is. We KNOW that this claim is false because Venus is an empirical example that falsifies it. We don’t need to do it here on earth because the experiment has already been run. Doesn’t matter if the hypothetical was possible. It was the authors hypothetical. He claimed that you could keep adding CO2 indefinitely and not get more than 5% increase. Which is false. It seems clear from the article that the author meant increasing CO2 indefinitely through the burning of fossil fuels. The entire article is about that. Implying that the author meant otherwise adds little value to the debate. What does MODTRAN give for the surface temperature of Venus? It must be a pretty useless model if it can’t predict the surface temperatures for all the known planets! Ferd Berple: Your explanation is concise and, I think, correct. Atmospheric pressure is a function of earth’s gravity, which is a constant. Occam’s Razor in action? Relative humidity isn’t what matters when water vapor is considered as a GHG. It’s absolute water vapor content that matters. Moreover, most water vapor is in the lower atmosphere. As you you go higher in altitude, temperatures drop, and so does the ability of the atmosphere to hold moisture, so water vapor content drops. At 7.5 km altitude (400 mb, which is middle troposphere), which is the altitude shown in this graph from the web page you cited, air temperature runs about -35°C, and it contains only minute traces of moisture. Also, you need to remember that correlation does not imply causation. Assume, for the sake of argument, that it really is true that middle tropospheric humidity has been dropping over the last 60 years [which is questionable], and also that middle tropospheric temperature has been increasing over the same time period [which is also questionable], that still wouldn’t mean that atmospheric moisture content is inversely reliant upon temperature, which is what Arno claimed. There just doesn’t seem to be a plausible mechanism for such a causal relationship. There are many factors which affect either temperature or humidity, and could account for such trends. But, more fundamentally, even if it were true that the warming of air caused it to retain less water vapor rather than more, such a mechanism still could not reduce the warming effect of any other factor (like CO2) all the way to zero. No negative feedback mechanism, no matter how strong, can do that. A negative feedback mechanism based on temperature can only reduce the temperature increase if temperature actually increases. The greenhouse effect is determined by how much radiation is SENT BACK into space vs ABSORBED from the Earth. Angstrom did a simple experiment in 1900, which is confirmed today. A 20 in long column of CO2 at sea level all the way to 10000 ft height absorbs NO heat. CO2 absorbs strongly, about 16% of the solar energy. It does it however in a very narrow spectrum band. All the energy in the CO2 spectrum is absorbed by even 60ppm CO2, 20% of the CO2 around. That’s why that band is empty. The only effect of extra CO2 is that that amount is a small change in the altitude at which the absorption happens. By contrast, water vapor absorption is roughly proportional to the amount of vapor. So water vapor is the main driver of greenhouse effects. Based on historic evidence, water vapor acts as a stabilizing thermostat. As I explained above, this is not true in general. Please stop saying it. If you do not understand integral control, then you do not understand one of the most basic types of feedback, and you prejudice knowledgeable members of your audience against you. Say you and a dozen friends (Fn) each have a tennis racket and there is just one ball. Someone, say F1, starts and hits the ball toward F3 who hits the ball toward F7. F7 hits toward F9, to F11, to F8. F8 hits the ball over a wall and into a lake. Have F1, F3, F7, F9, F11, and F8 trapped the ball? Do they have some sort of net gain or loss? Suppose F1 had hit the ball into the lake on first contact? What if everyone hit the ball twice before it sailed from the playing field? Suppose the ball is missed and rolls on the ground for 2 seconds before it is started on its way again? A more scientific view is at the link below that shows what actually happens as a CO2 molecule responds to absorbed photons. I still don’t understand the high surface temperature of planet Venus. (where C1 and C2 are concentrations of CO2) cannot explain a mean temperature of 737 K.
Is has been argumented that the high preesure explains the rise of temperature but I don’t understand this. If you compress a gas you observe such an effect. But this compression happened in far history so – after that long time – the excess heat should have been radiated to space. Which effect leads to such a high temperature on Venus? Remarkably, IPCC Published reports , (TAR3), do actually acknowledge that the effective temperature increase caused by growing concentrations of CO2 in the atmosphere radically diminishes with increasing concentrations. Perhaps now you need to go forward to 1931 and read the paper from E.O. Hulburt that shows that Ångström and his assistant Herr J. Koch results were wrong both at experiment and theory, They should have got 1% not 0.4% if they did the experiment properly and the theory was at odds with both reproduced experiments and the newly emerging Quantum Mechanics calculations. As I had tried to explain to many of the pseudoscience types on here QM gives a very precise calculation of what will happen and it is way beyond the stupidity of climate science or your garbage. QM already knows that Ångström’s argument is trivially and stupidly wrong and we record it in history as such and it’s ridiculous that you go back to an argument that is settled way beyond your ability to argue it because you are trying to invalidate Quantum Mechanics. So instead or repeating already dead and fatally flawed science Adrian read what Hulbert who was studying the new field of QM found happens when you mix water vapour and CO2 and that the result is entirely unexpected and inconsistent with classic physics but complete consistant with what QM predicted. There is no classic way to explain to you what is happening the result makes no sense from a classic physics sense and that in a nutshell is why climate science is in the rather stupid loop it is stuck in and we even have nutcases that think the greenhouse effect doesn’t exist. What gets up my nostril is the answer from science via QM is and has been available to people since 1931 and it is beyond the reach of classic physics garbage and any argument you can conjur up. QM tells you the answer both water vapour and CO2 are quantum active gases and they react with each and no you won’t be able to understand it using classic physics. So lets see if you actually get up and read Hulburt’s paper and QM analysis and grasp that you and Angstrom are trivially and fatally wrong. 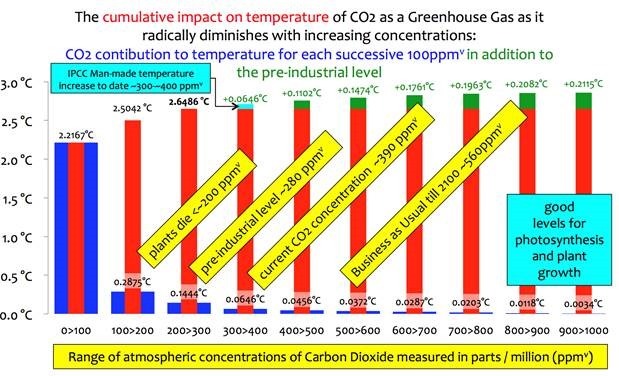 Hopefully you will understand that how the greenhouse effect works is way beyond climate science stupidity because we have CO2 and water vapour lasers to confirm QM calculations. The unknowns in climate science that hard physicists can’t answer is what the positive and negative feedbacks are outside the main QM behavior of the gas mixture. We can’t answer those because the earth doesn’t have the precise control of a laser tube. Even though CO2 levels are measured in parts-per-million, there’s nevertheless already so much CO2 in the atmosphere that it blocks nearly all of the IR that it can possibly block. So adding more CO2 doesn’t have much effect on temperature. For CO2′s main absorption bands, we’re way, way past the CO2 levels at which the IR is all absorbed. So how does such a small part of the atmosphere absorb all of the infra red. There is a lot of space between the CO2 molecules????????? Aren’t you assuming that the CO2 blankets the whole atmosphere?? This still relies on using a property that CO2 does not have ie., to retain heat. Water vapour can but only through latent heat which is NOT the GHE. If CO2 could heat the atmosphere as indicated then at 400ppmv it would be radiating in the near UV which would be easily picked up and measured. Another thing, the GHG molecules in the atmosphere are saturated with energy through insolation. They cannot become supersaturated due to surface radiated LIR. A startling statement. Could you elaborate, please? “Look, the big CO2/Water-derived infrared light really is there! due to false readings occuring. and be lauded as a genius before his time. This is a review paper by the author of the site. Thanks for that. I will check it out. Have to leave now, on a trip. One quick thought. The IPCC says that some of my friends are hitting the ball back to the earth and heating it up. That seems to me, to be more than a delay of the ball reaching outer space. The best place to go for understanding CO2 behavior is the hard physics area most of which have absolutely nothing to do with climate science. Knut Ångström the son of Andres after whom the unit is named faced almost the equivalent of an adverse finding over his experiment on radiative theory. The reason being was because if the result stood then QM theory was wrong a fact E.O. Hulburt noticed and replicated and re-did all the experiments. It is via the subsequent enquiry that we know that Knut entrusted most of his experiment to his lab assistant Herr J. Koch who basically fouled it all up. I see WUWT did an article by Anthony(Story submitted by John Keh) on the argument between Arrhenius and Ångström (http://wattsupwiththat.com/2012/04/30/a-tale-of-two-altitudes-how-stratospheric-temperature-is-de-coupled-from-the-surface-temperatures/) what he misses in all that is the fact Ångström is most certainly wrong as shown E.O Hulburt showed because for it not to be wrong put QM in a degree of trouble to be blunt it was an invalidation and so it was a big deal to QM. Most of the Knut Ångström story is in Swedish which is why it’s probably not well known to those outside the QM field. E.O. Hulburt is a rather interesting man who I encourage all to read his papers and the Naval research laboratory still gives out an annual award named in his honour being the E. O. Hulburt Annual Science Award. The bottom line is Knut Ångström and classic physics is wrong and QM prevailed and repeating an argument settled 100 years ago is pointless because if Ångström was right then QM must be wrong and we know that isn’t so. It would only be a supercritical fluid if its temperature was over about 30C and since the average temperature of the earth is considered to be around 15C then it would be liquid or possibly even solid. Well, for one thing, you emission to space in the 14 micron band occurs high up in the troposphere. That means that when you add more CO2 to the atmosphere, the level at which the radiation from CO2 can be effectively emitted to space moves up, and because of the lapse rate, this is at a lower temperature, and because of gravity there is a lower concentration of CO2 (the pressure is lower). The net of this all is that there will be less emission in the 14 micron band and the surface has to heat up. Not a chance! Even if the amount of CO2 was added at present temperature the vapor pressure of CO2 would be over 10atm, at that concentration the surface temperature would rise to super critical values (and then the pressure would increase to 92atm (the original proposition). How about this for a “layman'” explanation. If you would build a greenhouse with single thickness of glass, you would observe an increase in temperature. Great! I will add another thickness of glass to increase the temperature. It may of increased some but not like the original…I’l just add another pane. Hardly any measurable increase. That’s what we mean by a logarithmic effect. You are confused, Bart. If temperature doesn’t change, then a feedback mechanism based on temperature changes cannot possibly have any effect whatsoever. I have a degree in Systems Science. I understand control systems very well, including PID industrial controllers (the “I” stands for “integral”). Regardless of how you set the “I” knob, you still can’t reduce the effect of other inputs to the system all the way down to zero. Positive feedbacks amplify an effect, and negative feedbacks attenuate it (though with time delays they can also cause oscillation). But no negative feedback mechanism can ever attenuate an effect all the way to zero. What’s more, if you’re really claiming that temperature integrated over time is negatively coupled to atmospheric water vapor content (i.e., a history of warmer air causes reduced atmospheric water vapor content), then, pray tell, how on earth do you think that could possibly work? What could cause such a thing? To understand the answer, consider an analogy: a liter of pure water in a clear, 10x10x10 cm cubic jar or box, and one drop of food coloring. Our (99% N2+O2) atmosphere is like the water, and CO2 is like the food coloring, except that the “color” of CO2 is from absorption in the invisible IR range. If you add one drop of food coloring to the liter of water, it will very noticeably tint the whole liter. But one drop is only about 0.05 ml, so one drop in one liter is 0.05 / 1000 = 0.00005 = just 50 ppm. But consider: although the atmosphere is less dense than liquid water, it is miles thick. The full thickness of the atmosphere is about the same mass as a 30 foot deep layer of water. Your cubic jar of colored water is only about four inches thick. So to get an equivalent thickness to the Earth’s atmosphere, you’ll have to stack up 90 of those jars of colored water in a 30-foot-long row. Now, look through (or shine a light through) the row of 90 jars of colored water. Imagine how deep the color will be, from just 50 ppm food coloring. That’s why just a few ppm of a trace gas can significantly affect the spectrum of the light which passes through the Earth’s atmosphere. That is precisely what integral control does, and my respect for your opinions has just plummeted to near zero. This statement is worth debating. The former is not. Concede the former, or forget further discussion. normal daily temperature variations at any a single location of 10⁰C to 20⁰C. It can be as much as 40⁰C to 50⁰C over the course of a whole year. The greenhouse effect of the CO2 despite the claims of this article. The simple answer is that having more CO2 acts like a thicker layer of insulation. The visible light from the sun goes straight through and heats what it hits. The infrared radiation emitted by the heated surfaces has to work its way up through more CO2 (more insulation) before escaping. Think of CO2 as an insulation which doesn’t loose it’s R factor even when compressed. So lets imagine a uninsulated house with a copper shell, and a small furnace continually burning the same amount of fuel. This will generate a steady amount of heat that needs to be radiated from the exterior of the house to maintain a stable temperature. Suppose that given an outside temperature of 0 degrees the interior stays a 60 degrees. Since it is uninsulated the surface of the copper shell is at 60 degrees too. So the exterior of the house at 60 degrees can loose exactly all the heat from the furnace to the 0 degree outside air. Now lets insulate the house with one inch of this special R factor stable compressable insulation on the outside surface of the copper shell. We will ignore the trival addition of surface area this causes. I’m also going to simplify and assume that you loose ten degrees of temperature for every one inch of insulation. So if it was at 60 degrees in the house the additional one inch of insulation causes the exterior to drop to 50 degrees (while the interior is still 60). At 50 degrees not as much heat is lost to the 0 degree air. Think about it, if the exterior was 0 degrees it would lose zero heat to the air, so as it gets colder it looses less heat. In order to balance the interior temperature will rise till the exterior again is at 60 degrees. It has to rise to 70 to be able to have the exterior be 60 (there is ten degree drop over the thickness of the on inch of insulation). Now if you add an additional one inch of insulation the temperature drop across this layer is again ten degrees and now the exterior is 50 degrees. Again this is too cool to radiate all the heat from the furnace. The outside surface temperature would have to rise back up to 60 degrees again in order for the heat to be radiated. So the interior temperature will again rise by ten degrees to accomplish this. Now it is 80 degrees inside the house, 70 degrees after the first inch of insulation, and 60 degrees after the second inch. Now this insulation is compressible. We could compress the two inches down so it is only one inch wide, and still generate a 20 degree drop over the entire depth of the insulation. We can keep doing this, add another inch and the interior has to be a 90 in order for the exterior to be at 60. Another and it goes to 100. Etc. Now the R factor of the insulation depends on several factors. One of which is how much radiation it intercepts going out. Others include how fast heat is conducted, or convected through the material. If you make the insulation thinner some factors are going to overwhelm others. When the insulation is very thin the R factor is going to go down because some percentage of the radiant energy will pass right through without ever hitting any molecule to be absorbed and reradiated. Say in our imaginary insulation that 50% of radiation just passes through one millimeter of material. Well if you double that two millimeters you now capture half that 50% that passed through to have a 75% capture rate. Now one inch of our imaginary material in 25 mm thick. So only 1/2^25 of the radiation can get through. That’s 1/33554432 or only 0.000003%. The fact that one inch of our insulation blocks 99.999997% of the direct radiation does not mean it is only radiating .000003 percent of the heat. It just means that the other factors, like conduction and convection are the main means by which the heat moves through the material. In fact 100% of the heat being produced by the furnace is traveling through the insulation and is being radiated by the exterior surface. One of the means that heat travels through the material is via internal reradiation and absorbtion by the material. For every point A inside the material the point B one inch further towards the exterior is ten degrees colder. Point A would like to radiate directly to point B but cannot because the intervening material blocks 99.999997% of radiant energy. I can radiate .000003 percent of its heat directly and it does. But point B also back radiates in the other direction .000003 percent of what it can. Point A also radiates 50% of it’s heat directly to a point only one millimeter away, and that point 50% of what it can back. However those two points being much closer are also much more similar in temperature. So interior radiation can play a factor, even if we don’t have any conduction or convection, but it is NOT easy for the heat to move through the material in this way. If you are confused, like many here, you might think that the fact that 99.999997% of the radiant heat (infrared) is blocked by one inch this insulation that adding more insulation cannot accomplish anything. While it is true that you can keep on increasing the insulation and can only hope to block at most .0000003 percent more of the DIRECT radiation that is NOT how most of the heat is being transported at that point anyway. Most of the heat is passing via conduction, convection of air in the spaces of the insulation, and interior radiation. In fact at that point 99.99997% of the heat is being transferred by the other factors which totally depend on the amount (not thickness) of this special material. I said amount because we can shrink or expand the material and the same amount of material causes the same amount of insulating. Now even with this imaginary material things are more complex than I have explained. It wouldn’t even be possible for one thing, because when you compress the material the molecules will be closer together. Since temperature is a function of how fast the molecules are vibrating (or moving in a gas) they will have more opportunites to collide, and convection would increase. Nor is this imaginary material a perfect analog for CO2. I will not go into the differences, but it is close enough. So once you have gotten to the point where CO2 is blocking 99 percent of the radiation it is not true that you can only insulate another 1%. At that point the direct radiation is only 1% of the problem. Over 99% of the heat is moving through the atmosphere by other means. That amount of CO2 will have a certain R factor due to how slow the heat moves through the material by those other means. It will cause a certain amount of temperature rise. Simplistically, if you double the CO2 from that point then you get double the insulation value. There are however all sorts of other factors that counteract a simple doubling of R value for a doubling of CO2, negative feedbacks Pressure goes up in the lower layers allowing more conductive transfer. Heat is conducted to other greenhouse gasses which reradiate at wavelengths that can pass right through the additional layers of CO2, etc. These factors are negative feedbacks on the insulative value of having double the CO2. The pressure on Venus is not the cause of the increase in temperature. It is the side effect of having so much more CO2. Venus has 92 times as much atmosphere to begin with, and a much larger percentage of that atmosphere is CO2. Venus has a 96.5 percent CO2 atmosphere. Ours has only around 400 ppm. Not sure of exact percent because you have to adjust for molecule weight but it is close to 0.04 percent. There is 2412 times the concentration of CO2 on Venus and 92 times as much atmosphere. That’s a whopping 221950 times as much CO2 for the heat to get out through. The negative feedbacks are fairly powerful because the temperature difference between earth and venus is no where near the multiple of the difference in CO2 (plus we have other greenhouse gasses like water I did not count). Heat conducts very well through an atmosphere compressed to 92 bar, and there are winds on Venus and thus much convection, the same velocity winds in dense atmosphere carries more heat content, etc. thank you for your long explanation. I will read it tomorrow (here in Germany it’s shortly after midnight. I’ve computed the CO2 ratio between the earth and Venus to 1:227641 – that’s almost identical to your ratio. If we assume that the natural GH effect of the earth is 33 K (I know that this is not a very good assumption) so the total GH effect on Venus should be 87 K.
Compared to the mean surface value of 737 K which I find in Wikipedia the GH effect of 87 K is far away from explaining that very high temperature. Baloney, you CANNOT increase CO2 indefinitely by the burning of fossil fuels. Eventually you run out. So that cannot be what he meant. Either that or it is yet another flaw in the article. That he makes these mistakes is not my problem. Fact is, that if you keep adding CO2 you can get temperature increases going all the way up to that of Venus. There is no 5% upper bound on the increase. The limiting factor is no absorbtion. The limiting factor is the amount of fossil fuels, and other sources of CO2. He is claiming that the amount of radition that can escape directly from the surface to space is the limiting factor. Which is nonsense. When you have 95% interception of infrared by greenhouse gases then the vast majority of infrared escaping the system comes from the upper layers of the atmosphere. Those upper layers are cooler precisely becasue they are heated from below and the atmosphere underneath is blocking much of the infrared. The closer you get to the surface the greater proportion of the surface generated infrared can heat the air. Assuming 95% then only 5% of the direct surface radiation is available to heat it, and yet that upper layer can radiate directly to the near absolute zero of space. Meanwhile air near the surface gets nearly 100% of the infared impinging on it from the surface, but cannot radiate directly to space (except for around 5%). 95% of the reradiation from air near the surface is being captured by higher layers of air which are way warmer than space. Thus it is much more difficult for it to get rid of that heat. That is part of the reason for the temperature gradient in the atmosphere. Additionally the pressure gradient means that air higher up is naturally cooler (lapse effect). The heat vibrations near the surface need to be much more vigorous to support the 14 lbs per square inch pressure. Higher up, where the pressure is less a lower temperature can support all the air above it without collapsing. When you add more CO2 you are moving some of it higher where it is cooler and this is the part that can radiate to space. That higher cooler CO2 is an additional blanket over the lower CO2. Like the house with more insulation having a cooler surface radiating means higher interior temperatures. But the result T = 238 K was correctly calculated. Very simplistic. And, not generally true. The distribution of the gas is extremely important. The surface temperature increases inversely with the mean altitude of the layer – increase the altitude, and surface temperature decreases, decrease it, and the surface temperature increases. So, if you make it more dense, but move it to higher altitude, the two actions oppose one another, and the surface temperature may increase, or it may decrease, or it may stay the same. Of course you can add whatever clauses you like into a hypothetical argument but the energy has to come from somewhere so you’re assuming that we’re adding CO2 AND supplying the energy to get it to the temperature where it becomes a supercritical fluid. You might as well assume the sun doubles its output to match Venus’ insolation and that the water vapour is lost to space too. Because is is way more complex than you are making it out to be. There are also positive feedbacks and a big difference between a atmosphere that is mostly non-greenhouse gas with a little mixed in vs. one that is nearly all greenhouse gas. The lapse effect is a positive feedback. I understand the concepts but have not done this kind of math since I was a kid, and am not in the field. I can give you an example of something I would think was a positive feedback but I am not going to be able to compute it’s strenght vs other factors. The fact that most of the visible light is absorbed at the earths surface, vs on Venus where it is absorbed at the top of the cloud layer is going to have an effect. On venus the less dense upper atmosphere is heated, and most of the energy then needs to move up from there. If you could magically drop the temperature Venus to say earth temperatures I think the following would happen. Most of sunlight would heat the tops of the clouds. Let;s pretend they are half way up the 92 bar at 46 bar height. The extra heat at that height is causing a certain amount of velocity to be imparted to the molecules. These higher molecules will bang on the lower ones transporting heat downward. The few percent of light that strikes the surface will also be heating from below. However the vast majority of energy will be moving both downward from the tops of the clouds and upwards from the tops of the clouds (some upwards into space). The same amount of sunlight being absorbed by a less dense material will bring it to a higher temperature. There will be more energy per molecule. So the fact this is being absorbed very high in the atmosphere means it will be getting hotter than if absorbed at the surface. There is still heat being pumped in at the surface but it cannot radiate past this higher temperature upper atmosphere. Since heat is being pumped in continuosly at the surface it must be hotter than the high temps above it in order to transport it upward. Once equlibrium is reached no heat will be transported downward from the cloud tops. All of that will go upward. The few percent of heat impinging on the surface will travel upward. Because most of the heat is captured and radiated above the clouds I would expect the high atmosphere to have the most convection and winds. Since little energy can escape by radiation almost all the impinging energy will go into causing convection currents. Wind speed should be higher up higher in the atmosphere. This is all speculation on my part. But you can see that there are complexities that your simple formulas do not take into account. The profile of the earth atmosphere temperature with height is not a simple one of closer to the ground warmer either. As you go higher the temperature drops rises then drops then rises. The very top of the atmosphere has very little green house gas in it and so cannot radiate to space. It is being impinged by solar particles (and may also absorb some component of sunlight). So it is actually hotter than the layers below it. Things just aren’t so simple as your formula, and frankly I can’t tell you exactly why it is so hot on the surface of Venus but the vast quantities of CO2 play a role. Yes, I know that my calculation was very simple and that there are additonal effects. I’ve done it to get a scale of the greenhouse warming. I would not be surprised if the actual temprature differs by 50 K or a little bit more. But if you are right the logarithmic relation between increase of CO2 and increase of temperature is not valid for Venus. The Venus is ~400 K (!) hotter than expected when assuming this logarithmic relation. By no way you can reach a rise of 400 K using a logarithmic relation. Because of that I supposed that there are other effects contributing. And because of that the greenhouse warming may be not the primary effect, so it cannot be quantified. Density of the CO2 isn’t the important factor. It is thickness of layer containing CO2. More CO2 means more at higher elevations where as you admit it is colder and therefore the outer layers of CO2 will be radiating less energy with the same lower atmosphere temp. Just like with the house example. The bottom layers need to heat to raise the temperature enough transport the heat through the atmosphere to a higher level (and therefore raise temps on the greenhouse gases that are in the upper layers where it can be radiated directly to space). Several commenters have already pointed this out. You seem to believe that more CO2 is going to make things colder. Also how the heck do you “make it more dense and move it to a higher altitude” that’s ridiculous. The density is a factor of the altitude and temperature. I would like to hear all you gyro pseudoscience junkies explain how your microwave oven works and develop your classic physics stupidity to discuss it because you are faced with the same problem. Some real world reactions are simply beyond the reach of classic physics because they don’t even understand how the effects occur. You will find many real world studies of CO2 laser beams interactions as they pass thru the atmosphere and the CO2-water interactions because it is a key understanding how high energy laser weapon pass thru the atmosphere for both land based and space based weapons. A reasonable overview can be got from the link (http://www.ausairpower.net/APA-DEW-HEL-Analysis.html#mozTocId18199) and nothing to do with climate science. If you go back and read your own stupidity that most of you have written a CO2 laser beam couldn’t go very far in the atmosphere because it’s saturated and would be completely absorbed or some other stupidity. It may interest some of you gyro gearloose types that publicly you can get the information on how 10.6um moves thru the atmosphere from up to 10Km from military publications (http://oai.dtic.mil/oai/oai?verb=getRecord&metadataPrefix=html&identifier=ADA187679). There is data available from space but it is largely still classified but you may pick up snippets here and there as usual on the web. The science of water vapour continuum is not so well known from the hard sciences and military there is still currently no single accepted theory or model on reactions because it has a massive number of interactions and to be blunt before climate science debate it wasn’t considered important. There is a reasonable summary of the current state on water vapour on the UK met board website (http://www.met.reading.ac.uk/caviar/water_continuum.html). The UK met board correctly states => “Thus, a deep controversy on the nature of the water vapour continuum still remains unresolved.”. So hard physics science understands how CO2 emissions react they interest us, water vapour we don’t know so much about. With more CO2 in the atmosphere, the IR within CO2’s absorption bands which is emitted from the surface is absorbed, on average, at an ever-so-slightly lower altitude. But since that altitude is just a few meters(!! ), it doesn’t matter much. The transport mechanisms which move heat from the lower atmosphere to the upper atmosphere, where it can be radiated to space, work just the same, and the surface temperature is not much affected. The only exception is for those IR wavelengths (mostly on the fringes of the two main absorption bands), for which CO2 is just a very weak absorber of IR. Interesting thought. That would be a negative feedback mechanism (helping to stabilize temperature), were it significant. But I doubt that it is. So Dave if CO2 is this massively good absorber of IR and you fully understand the physics how can I pass a 10.6um CO2 laser beam thru the air not just a few meters but kilometers if I so desire. Look carefully at what you said and your garbage classic physics predicts I shouldn’t be able to pass a CO2 emission like for a CO2 laser thru the air because the CO2 in the air will absorb it that’s what your saying. No, it’s not. Adding a bit of negative integral feedback can improve the precision of a control system (at a potential cost in stability), but it cannot completely eliminate the effect of any other input. No feedback mechanism can do that, because, by definition, feedbacks react to an output of a system, and “feed back” to affect the inputs. Unless the output is perturbed, there’s no feedback. Of course you don’t want to talk about it, because you must surely know that it’s silly. There’s no plausible way that such a mechanism could work. We know how warming increases evaporation and atmospheric water vapor content, and how cooling the atmosphere has the opposite effect, causing the water vapor to precipitate out, and since water vapor is a GHG this is obviously a positive feedback mechanism for temperature. But, contrary to wishful thinking, size matters, and the alarmists’ first error is in their failure to quantify the effect, which is actually quite modest. (Their second error is their failure to take into account various negative feedbacks.) But it is no good pretending that positive feedback from water vapor doesn’t exist at all. That’s just wrong. You need to answer the question Dave how come I can pass a CO2 emission cleanly thru the atmosphere infact the only thing that will limit you is things like water vapour. You state CO2 simply absorbs IR that’s your level of understanding I get it but lead also absorbs certain types of radiation I am sure you know that. Put enough lead in the way and your radiation can’t pass thru it I am sure you know that. So how come I can’t put enough CO2 in the atmosphere to stop a CO2 laser passing thru it. That’s the big problem O.E.Hulburt was working on in 1931 it’s not complicated how can something that is absorbing not block answer that answer your problem. For others interested you can’t block a CO2 laser with CO2 because it is a positive gain medium. The lead and radiation is a negative gain medium example the one classic physics is much more familiar with. There is no way to understand why a CO2 laser can pass thru CO2 even though it absorbs at those frequencies under classic physics and to attempt to do so is stupid because there is no basis to understand it … if I told you radiation increased as it passed thru lead would you believe me because that’s the same issue? That’s the very basic problem with people trying to understand CO2 and its behavior using classic physics it simply won’t work all we can do is sort of create a half baked lie. All of the garbage written by most of the pseudoscience types in the above comments don’t even get the basic problem of trying to understand positive gain mediums .. end of story. Because 10.6 µm is not within any of CO2’s strong IR absorption bands. The major CO2 absorption band is centered around 14 µm, with narrower bands around 2.6 and 4 µm. Within those bands a photon can only travel a few meters through the atmosphere, on average, before it is absorbed. 10.6um is the dominant frequency of CO2 … classic physics says if I absorb at that frequency it shouldn’t pass thru it … and that’s your logic. This is not some associated band of CO2 it is the dominate frequency. Classic physics put CO2 in front of beam says it should block it and that’s the logic you have used above. It’s blatantly wrong you can see it’s wrong a CO2 laser is emitting exactly CO2 absorption frequency to an incredible accuracy. You don’t have to understand a CO2 laser to understand the problem your physics above just got smashed by an observation that CO2 is allowing a frequency it absorbs to pass thru. Lets put this in perspective as you do to the bottom of the ocean it get darker because the water absorbs the light … if we did the same with an ocean of CO2 the beam would hit the bottom with no loss of intensity … SEE THE BIG DIFFERENCE. Yes CO2 absorbs IR but it does not block it and that is why your explaination is garbage. Classic physics can not explain positive gain media there is now ay to do it nor can I explain to you how your microwave at home works using classic physics either. So the moral of the story is stop trying to understand CO2 absorption using classic physics you can’t do it and anything you try and explain will be blatantly and obviously wrong. To add to Dave’s response the reason why the CO2 laser emits strongly at the 10.6 Micron level is because it is not just CO2 but a mixture of gases including He and N2 that is inside the laser. That mixture is balanced in precise proportions that allow the CO2 to move from the excitation state emitting a 10.6 micron photon, and then down through various states to the ground state without shedding other photons, where it can then be excited again. The CO2 can move through the lower states by shedding vibrational energy to the other molecules, some of which shed energy to the container wall. Air just does not have the right proportions of gases to support CO2 in this absorption band, nor a container wall, and therefore air is very transparent at 10.6 microns. Gas proportions effect absorption. One of the many complexities, and no I do not understand the quantum mechanics (quantum state shifts) involved but it is important. Well Lbd the surface of the earth isn’t a CO2 laser so it is emitting at wavelengths which CO2 will absorb given the proportions of gases in the air. The earth does emit some IR at 10.6 and that just escapes. Oh, and none of what I’ve written implies that I think we are going to get Venusian temperatures here. There is no way to generate that much CO2, we don’t have sulfur clouds, and I believe H20 is a strong negative feedback. Yes, negative not positive, because of clouds and because water vapor is lighter than air and thus can act as a heat pipe working fluid. Like someone said above however a negative feedback cannot be greater than it’s driver. Thus adding CO2 will drive temperature up, and if you keep adding it then temps will keep going up. CO2 radiates energy at specific levels. No more, no less. But, when it is spread out at higher altitude, there is much more surface area to radiate, increasing as the square of the radius. When the thickness of the layer increases, the area at the bottom decreases, and the area at the top increases, due to the spherical distribution. This produces less efficient back-radiation to the planet and more efficient radiation to space. Result: cooler planet. There is no fundamental physical reason that the heating due to CO2 must be monotonic with increasing concentration. It is only required that the energy it radiates back acts to raise the surface temperature above what it would be without any CO2 at all. But, the partial derivative of surface temperature with respect to concentration can be positive, negative, or zero. Actually, there are many possibilities. But, I agree, it is silly to discuss with someone who not only does not know what he is talking about, but insists on repeatedly demonstrating it. I didn’t claim it is monotonic. The thickness of the atmosphere compared to the diameter of the earth is so thin that the difference in area between the sphere defined by the surface of the earth and the surface of the top of the atmosphere that still has CO2 is negligible. Hotter CO2 radiates more energy than colder. It radiates more at the whatever wavelengths [it] can. Adding more CO2 doesn’t cause the existing CO2 to spread out, silly. It causes increased density at all levels. It is just that at the top there is next to none so it causes that boundary to move up. That was “it can” not “I can”. I did err previously in saying that increasing the mean altitude of the layer causes a decrease in surface temperature. The surface temperature function appears likely to be monotonic in Rlo/Rhi, where Rlo is the radius of the effective lower boundary, and Rhi is the radius of the effective upper boundary. If we set Rlo = a – d/2 and Rhi = a + d/2, where a is the median altitude and d is the depth, then we can easily show that Rlo/Rhi increases for increasing a, and decreases for increasing d. Since the function is monotonic in the ratio, it behaves in the same manner. In fact, you can pick a to be any radius which remains within the layer, and find that increasing the depth always cools the surface. I realized this dynamic when discussing Willis Eschenbach’s “Steel Greenhouse” here. Although the thought experiment is only analogous to the true situation, I do not see any reason the result should not carry over. No. CO2 radiates energy it receives from the ground back to it. That is the whole basis of the GHE. Some of that energy gets radiated back to the planet. Collisions do not generally cause photon emission, so the ambient temperature is not relevant. Yes Brain I understand how the laser emits that’s not the importance where it emits it also absorbs that is what QM is all about. What makes a laser media is the fact that it behaves strangely in that it can absorb yet transmit that frequency that is because most of the energy goes into resonant modes. All the other gas mixtures are there to help efficiency of the CO2 by assisting the optical pump and aid in cooling the tube. Normal negative gain media don’t behave like that they absorb the emission in a one way process because they don’t resonate and block the transmission as you see with visible light going down in an ocean. It is one of the interesting things about laser media is the absorbed frequency must also be transmissive otherwise the beam would in effect be blocked by the gas or media in the tube or optical cavity. It’s why not all elements can be made into a laser media. So for a laser media you want absorption yet transmission and that’s because those two things are separate things just because something absorbs does not mean it won’t transmit or as Dave wants it blocks at that frequency. 10.4-10.6um from CO2 emissions are not important from Earth science point of view I agree but they do show how wrong Daves argument about absorption and blocking is. Brian I thought of an easy way to invert the problem on you. Basically your argument is 10.6um CO2 laser emission passes thru the atmosphere without really interacting with it and heads out to space. At a layman level that is sort of fine but you are ignoring the QM reality that it isn’t anything like that the beam is fully and continually interacting with the CO2. So here is the inversion for you does increasing the CO2 level change the transmission characteristics of the the 10.6um beam ….. your argument is it shouldn’t do anything right because they don’t interact. Want to have a guess what happens??? See this has nothing to do with climate change its the physics of transmission of infrared thru the atmosphere. I asked a physicist this question and his reply was that to increase energy uptake by a IR receptive molecule you would have to increase insolation. Surface radiated energy was within the emission spectra of these molecules so would not be adsorbed. If a molecule was saturated with energy, remember these so called molecules are under energy bombardment as long as the sun shines so reach radiative equilibrium, saturated, and remain at that point. Remember equilibrium is reached when energy in equals energy out. This equilibrium is reached due to high energy solar radiation not low energy radiation from the surface. They cannot get hotter than the radiative equilibrium temperature otherwise this would not be at equilibrium. They loose energy through radiation and kinetically through collision with other molecules. Also energy levels dictate the heat path, ie., hot to cold and never cold to hot as required by the theory of the GHE. This site has several papers on energy flow, the GHE, written by an Canadian astrophysicist Joseph E Postma. No that’s not necessary, increasing the CO2 concentration by the amount proposed would reduce the IR losses from the surface thus causing the temperature to increase. Only a small increase in the temperature would be required to reach the supercritical state, in fact in the tropics sufficiently high temperatures already exist. Yes, no doubt that is why Global Warming has been accelerating for the past 15 years. Only, it hasn’t. In fact, it hasn’t even been warming at all. The idea that the missing warming is “in the pipeline” is obviously a flail of desperation. Skeptical Science has a lot of nice, pat, straightforward if you will, points on a lot of climate related subjects. It isn’t popular here because it is sophomoric and generally wrong. It would be greatly appreciated if somebody could provide me with a layman’s way of explaining this to people. Being a motor head, I always use a hp/speed analogy. Almost any motorcycle will go 100 miles per hour. Getting to 120, well that takes more power. Getting to 140, well that takes even more. Going above 140? Now you’re talking big horsepower. I think it’s a good analogy as the horsepower difference between getting to 100 mph and 160 mph is more than triple.
. . . the ball is missed and rolls on the ground . . . When energy is released by a molecule there is no preferred direction. Some up. Some sidewise. Some down. Any direction happens. Thus, radiation that starts in a direction away from one of Earth’s surfaces is as likely to end up back there as anywhere else. A surface might then absorb or reflect the energy. If the energy is absorbed, say by pavement, then the molecules of that move more rapidly – warm – giving a higher temperature. This is a temporary state because the warmed object will (1) radiate more then the cool one and the energy is sent on its way again, or (2) something in contact with the surface will be warmed – water might evaporate, O2 or N2 might warm and the air expand, thus conduction and convection work to move the energy higher into the atmosphere where it can be radiated to space. The ir-interactive gases (H2O) being the most abundant by far simply slow the loss of energy from the system. Because there is a delay in loss there is a slight warming. A collision doesn’t have to cause a photon emmission. It only needs to transfer heat. If the collision is just right it can result in bringing the CO2 to a vibrational frequency at which it can shed (at random) a photon of infrared light. Heat can be transferred between all the modes, and also effect velocity. CO2 can gain and shed vibrational energy to photons at the right wavelengths. Two colliding molecules of CO2 with the same lower vibrational energy can collide and separate with some of the vibrational energy transferring from one to the other, resulting in one at an even higher state, and one at an even lower one. Collisions can result in the conversion of velocity changes into vibrational energy and vice versa. All these conversions are symmetric. Plus CO2 can do the same with other molecules and atoms that are in the air, and with solid dust particles. When air is warmer there is an overall average higher velocity and energy content to it, and so more chance that collisions will result in the excitation of a greenhouse gas in it to the proper vibrational frequency at which it can shed a infraredd photo. Sure CO2 can adsorb and reemit a photon of easily between collisions. This is because it is always moving between vibrational states that hav an energy gap that matches the quanta of energy of the photon. Since the molecules spend way more time between collisions than the do colliding then of course it is not likely to drop to a lower state and shed a photon during a collision. The fact that in order for a greenhouse gas to adsorb a photo it must move between two states that a have a proper energy difference for infrared, means that it is in the exact energy state at which it can shed it, by dropping back to the lower state. This makes it easy to adsorb and release a photon before the next collision. There is nothing stopping a CO2 molecule from absorbing an infrared photon as vibrational energy and then transferring it to another molecule, atom, or dust particle as a velocity change. CO2 lasers depend on this fact to get the CO2 back to the ground state by shedding vibrational energy to the walls (of the N2 intermediary). CO2 in the laser at the lower vibrational states shed vibrational energy to N2 in collisions and then N2 sheds to the wall. If what you said were true then you could never heat a gas using infrared light. Heck, you could never heat any gas with any light of any kind. Which is baloney. You seem to think that the aborbed energy can ONLY, not preferentially, be converted back to light. This is wrong. Some percentage of light absorbed can and does result in a temperature rise in the gas. According to you if there were two 100% CO2 gas planets closely orbiting each other as a binary system, and one was hotter than the other, they would exchange infrared light, but the temperature of both would be unaffected by the partner. Such a planet a 0 C could start with a partner at 100 C, or at -50 C and it would not make a difference to how it’s temperature would change. It would exchange infrared photons, but never cool nor heat. Presumably if such a 100% planet were floating in space it would shed infrared to space yet never cool. Whatever infrared impinges on it would merely be reemitted, and none of the heat content stored in the velocity of the molecules could every convert to vibrational energy then infrared. The planet would stay warm forever since it is isolated by a vacuum from shedding heat via contact with other objects. John Marshall, That’s only on the side facing the sun. … also remember that the atmosphere is much closer to the earth. So even during the day half of the surrounding space points to earth, most of the rest to space, and a tiny circle towards the sun. Depending on how high you are in the atmosphere there is going to be differing influence of each. For example at night low in the atmosphere, say near the surface, the ground has much greater influence than space. While high in the atmosphere at night it is space that has the most influence. Oh, and part of the impinging infrared at any point in the atmospher comes from the atmosphere itself. LBD, “but you are ignoring the QM reality that it isn’t anything like that the beam is fully and continually interacting with the CO2” No, I’m not. The air is very transparent at this wavelength so in layman’s terms there is next to zero interaction with anything in it. If there were strong interaction then it would NOT be transparent, in layman’s terms. You can understand all this by empirical measurement, with no need to even know what is going on quantum mechanically. Just like I can tie my shoe without knowing about QM and even though our universe is QM from top to bottom. This is nonsense, the Earth’s radius is ~6400km, at an atmospheric emission height around 10km there isn’t much more surface area! But collisions can prevent emission which is why emission depends on pressure and temperature, near the surface the mean time between collisions is much less than the emission lifetime for CO2. The N2 is important because it is excited in the laser by an electric discharge, the excited energy state is a very close match to an excited energy level of CO2 and collisionally excites that CO2 energy level. From that excited state emission to a lower excited state takes place emitting a 10.6 micron photon (or 9.4). In order for a transition to occur there must be a population inversion so that lower level is depopulated by collision with the He gas in the tube. Absorption of this frequency by the atmosphere requires sufficient of these lower states in the atmosphere, however since it’s an excited state not a ground state that is rare. We are speaking specifically of emissions in the IR spectrum. There, the major effect of collisions is line broadening, which is second order. Besides, you are putting the cart before the horse. The lower temperature of the upper atmosphere does not prevent GHG molecules from radiating. The lapse rate of temperature in the atmosphere exists because of the radiation of GHGs in the upper atmosphere. If they did not radiate, the temperature gradient would disappear. 0.3% more. That may be small, but so is the change in temperature with altitude which Brian is suggesting results in greater surface temperature. “Voigt profile” for more info. No, the major effect of collisions in the lower atmosphere is to prevent emissions and to transfer heat to surrounding gas molecules, because of the long radiative lifetime compared with the meantime between collisions which is orders of magnitude shorter. “But, when it is spread out at higher altitude, there is much more surface area to radiate, increasing as the square of the radius. Clearly 0.3% is not ‘much more’, so you were clearly wrong. Brian’s change in temperature of 0.3% would be ~0.9ºC however. The Voigt profile is a description of the shape of the spectral line it is the effect of broadening that line due to concentration, pressure and temperature that governs the absorption. At the limit of weak absorption it’s a linear response, at the limit of very strong absorption it’s square root, somewhere in the middle it passes through an ~logarithmic region. Which is where we are currently in the atmosphere wrt CO2.